Well, here we go....another trillium post. If you haven't seen my prior 'writings' on trillium they can be found here, here, and here. First of all, apparently there are no highly experienced botanists that are out there reading my blog with any regularity. Why do I say that? 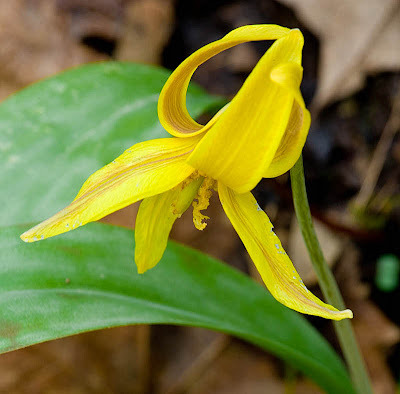 My last trillium related post lamented the fact that the emergence of the trillium had been delayed because of the cold weather we had been having. When I had gone out into the field expecting trillium, I was early and found only plants that I thought were trillium that had not yet bloomed. 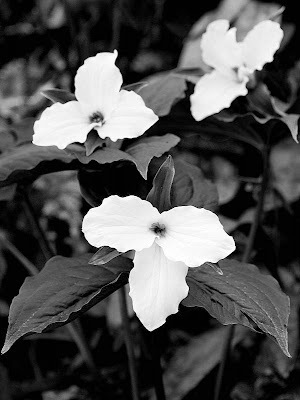 I ended up making some documentary and abstract type shots of the plants and calling them trillium. Well, I returned yesterday and the trillium were in early bloom, but, much to my surprise, what I had thought was pre-bloom trillium clearly was not. I am not sure what it was (if anyone out there can tell from the photo, please let me know), but I guess I will ultimately find out since there is plenty of it and I go back to this location frequently. At any rate, on this trip there were trillium in bloom, and it reinforced just how tough it seems for me to get really good shots of these plants. I could do more processing work on the following images and I do plan to return again as the lighting wasn't all that great on this particular day, but thought I would post what I was able to capture. In the prior posts, I had mentioned that I had wanted to portray the flowers as a 'sea of white', but that the plants simply grow too far apart for me to be able to achieve this. I got some great suggestions on how to capture that impression and, in particular, one from George Barr that I thought was quite on the mark and that I hoped would do the trick. The idea was to represent the 'sea of white' with three or four flowers made to look closer than they really were by 'compressing' the apparent distance using a long lens while keeping one flower in tight focus. The image could then be converted to black and white to accentuate the white flowers. I personally like the black and white version better, though I wish the background were smoother. This was taken with a 180 macro at a wide aperture, but because the flowers were growing on a very steep slope the background was at a fixed distance from the plant no matter what angle you came in from. Anyway, not perfect, but closer to what I was trying to get at. 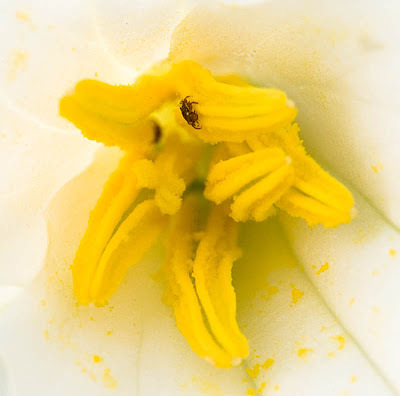 By the way, Mark Graf was apparently also out photographing trillium this weekend and got some absolutely marvelous abstract shots that can be seen here. Check out the amazing lighting he was able to capture! They inspire me to go out and work on the trillium some more.